Over the past year, I have heard a lot talk about living a “balanced” life. So at some point I decided that I needed to live a balanced life and strived to attain this sought after life of balance. 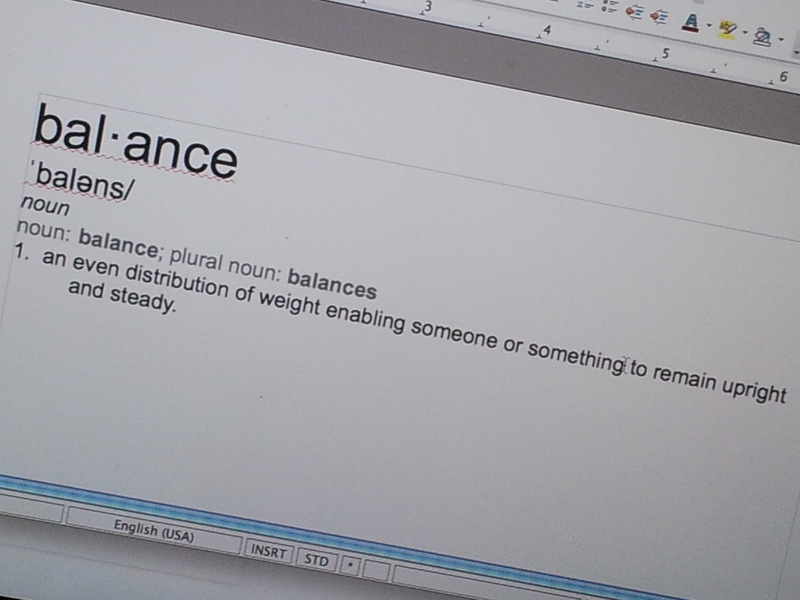 I even found myself looking up videos on YouTube about being balanced. Well after months of trying the only balance I seemed to find was the balance of depression and self doubt. I had become overwhelmed trying to be “balanced” leading me to become very insecure in all of the areas of my life. Many of us try to balance all of the roles we carry. Here are some of the responsibilities that many of us may be trying to balance in our lives. Well I have decided that having a balanced life is not for me. Maybe it is just the word “balance” that I have a problem with. I prefer to strive for fulfillment. Balance means to equally proportion so that you do not fall. Well trying to equally proportion my life was causing me to fall. I fell into a puddle of insecurities and a heap of discouragement. Not everything in my life is of equal importance and should not be balanced as though they are. What is of importance one week may not be of importance the next. I am a stay at home wife and mother and it truly is a blessing to be home with my little ones however, whether you agree or disagree it is the hardest job I have ever had. You are ALWAYS on the job. There is no time clock or set hours. How do you balance that? I drove myself crazy trying…so from now on I won’t. I am not saying that you should not try to organize your life. You absolutely should. But organize it in a way that works best for you. You can never do it all so don’t try. If you are a stay home wife and mother like myself with interest of your own it can be rough. You are with the children all day if they are young ones like mine and when your spouse comes home you feel like you need to give them your time and attention pushing your personal hobbies and interests aside. If you continue to do this you will only find that resentment is creeping around the corner. You will start to resent your spouse and children because you find no time to do the things you enjoy doing but ensure that their needs are always met. Accept that life can not always be balanced – Don’t try to spend equal time on things in your life that are not equally important. Realize that it is not about the amount of time spent but the quality of time spent – For example if faith is important to you do not try to spend time reading your devotions while your children are up. You will not be able to comprehend and reflect upon what your are reading if you are being distracted every 5 minutes. Wake up about 20 minutes earlier than the kiddos pour some coffee or tea. Read, reflect and have your quiet time. Welcome flexibility – I stated earlier that what may be of importance one week may not be of importance the next. For instance, I really enjoy writing and I decided to pursue a career in freelance. Every so often I come across a last minute submission call that is due in a day or so on a topic that I am familiar with and would like to submit an article. What I might have planned for the day with the kids I may not be able to do. It may have to be morning movie time so that I can spend time writing without feeling bad about it. I explain to them that because I am on the laptop “Mommy is working” because of course they do not understand that what mommy is doing all day every day interacting, playing, and ensuring that their needs are met is work…lol. So instead of trying to find the perfect balance in life try to just find a recipe of fulfillment that works best for you. Pick yourself up out of insecurities and discouragement do something make your mark in this world. Previous Previous post: Love Goggles. Next Next post: What are we speaking into our children? Success or Failure.